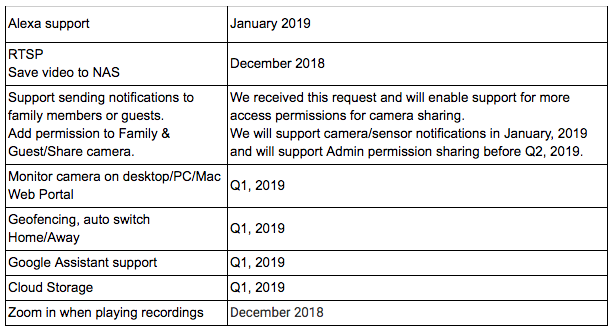 Our product managers have summarized the 10 key issues the Kickstarter eufyCam users have reported. We appreciate all of your feedback and questions, and will address these issues below. We will keep this topic updated, and feel free to let us know what other issues or feedback you have by leaving comments and questions below. 1. Why is the Wi-Fi coverage area so small? This is a top-priority issue and we’re working on a solution to improve the wireless performance, in addition to adding a range extender. Wireless performance optimization includes a wireless driver update and communication protocol improvement. We expect to release them late December 2018 or early January 2019. The range extender is in the hardware prototype stage and we are working hard to make it available in Q1 of 2019. 2. Why do I sometimes receive notifications and sometimes do not? Enabled/disable eufyCam to push notifications when the motion sensor is triggered in certain modes. Some Android devices might close the EufySecurity app when the phone is in power-saving mode, resulting in notifications from the system not being received by the user. We’re exploring solutions to make the EufySecurity app work better in any scenario, and will release a new version soon. Please stay tuned. 3. Why does HomeBase fail to install? Make sure your smartphone and HomeBase are connected to the same wireless router, and the Wi-Fi is not isolated from the LAN. Some houses have 2 network devices, for example one is the ISP provided Internet gateway/modem and the other is a router purchased separately. 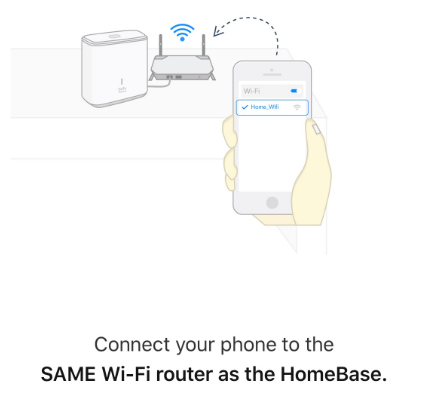 During setup, make sure your phone is connected to the same Wi-Fi router that HomeBase is connected to. Your phone should not be connected to the Guest Wi-Fi network. The LAN port is not dedicated for a set-top-box. HomeBase might take up to one minute to boot up. Please wait until its LED changes from red to white. Make sure to press and hold the SYNC button located on top of HomeBase until you hear “HomeBase is ready for setup”. 4. Why does the EufySecurity app indicate a microSD card error or no microSD card is found? The latest firmware has improved the microSD card software. Please make sure your system is on the latest software, reboot HomeBase and retry. 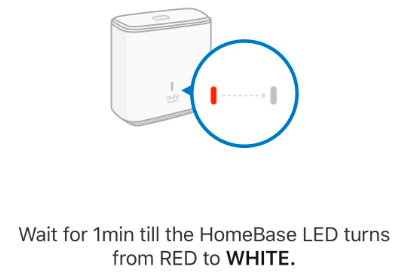 To reboot HomeBase, press the Cycle button on the back of HomeBase; HomeBase will reboot right away. 5. Why do I receive so many false alarms? In some cases, if the motion sensor’s sensitivity is set too high, the camera will detect events outside of your property, resulting in excessive false alarms. To avoid this, you should lower the motion sensor’s sensitivity level. You can use the Test Mode feature in Motion Detection to set the sensitivity level by standing at the desired detection boundary and trying out the sensitivity. 6. Why does the camera LED remain on after charging for a long time? This is a bug we recently verified. We’ve fixed it and will release a new version in the next 2 weeks. 7. Why does the system display the incorrect time? This is a bug we recently verified. We’ve fixed it and will release a new version within the next 2 weeks. 8. Why are some camera settings not saved? The current version of the EufySecurity app cannot save the Camera Off or Night Vision settings. To switch off the eufyCam, you can disable Motion Detection temporarily so that the camera will not detect or record events. To switch Night Vision off, you can disable Night Vision via the live-streaming toolbar. These are bugs we recently verified and will release a new version within the next 2 weeks. 9. Why doesn’t the sensor refresh its status automatically? We’re exploring solutions on how to make the sensor’s status update automatically. For now though, you will need to drag down on the Device tab to refresh the sensor’s status. @AnkerOfficial I don't see any comment about the video detection time delay missing the start of video events. This is a big concern for a lot of users. In my personal opinion, I would be willing to give up a few weeks of battery life for more complete event recordings. I think it is more important to capture whole events then to have partial recordings. And If you are going to come out with solar panel power adapters then battery life shouldn't be an issue. At the very least, you should give us, the users, the option to choose the mode and decide what is important to us. eliminate unnecessary alerts, such as passing cars and small animals? adjusting the Motion Detection Sensitivity to “Humans Only”? Right now motion detection is a number value and doesn't have this option. Motion detection sensitivity value of 100? Continued recording if detection is still occurring after max length is reached? 0.6 seconds delay between detection and recording starting because right now it's definitely not that short. Better face recognition which would allow us to not get notification for known people? IFTTT as mentioned above my post? All of these were promised features during the campaign. Under my Home settings I have notifications disabled, under my Away settings they are enabled. Both of those work independently as they should, but when I use the "Scheduled" setting I do not receive alerts during my designated "Away" times. +1 Maypo. I would like to not miss so much at the start of the video, and for the recording to continue on even if the motion has stopped. I don't see any comment about the video detection time delay missing the start of video events. This is a big concern for a lot of users. In my personal opinion, I would be willing to give up a few weeks of battery life for more complete event recordings. This would change how the system works. The cams will stay in a low power mode until they detect something. Once detected they will turn on and start recording. In order to keep them wireless and last for a long time battery-wise, they cannot be passively recording all the time. @AnkerSupport how come everyone got a reply except me? Hi Anker, not necessarily recording 24/7 but the delay between detection of activity and recording is very long. We are working on optimizing our alerts system. Yes, this is something we're working on at the moment. More to come! We will be addressing this in a future software update! This is also something we are working on refining. Your voice is heard! While this doesn't seem that short, the camera is staying in a low power mode - once it detects someone it is then turning on and recording. How many seconds is it taking for your cams in terms of detection? Hopefully this answers some of your questions. More to come so stay tuned! It takes 2-3 seconds at the moment. If it would be 0.6 seconds, that's acceptable. But right now it is taking longer than that. Why is this an evaluation when it was promised in the campaign? As for the other points, can we get an eta on when it will be fixed/implemented? Just had a terrible example of this. I have my camera on max sensitivity to record everything. My wife had been out, and was able to reverse onto our drive, get out and walk around behind the car, open the boot and begin getting things out before the recording started. Any chance we can get a feature that allows us to manually look for updates for the base station? Apparently, the latest version is 1.0.6.4, while mine is still sitting at 1.0.5.9. Any chance we can get some actual documentation on using the cameras? A pdf, a manual, something. How about an FAQ on the kickstarter or on a page here on your website? That way people can troubleshoot the problems they're having instead of having to shout into an endless void on either the forums here or in the comments on kickstarter and hope that someone knowledgeable sees it. Thanks for the suggestion! We do know that waiting for an update can be a bit annoying, due to how many fixes, especially, are in this one. It will take a day or two to update. Keep an eye on that version! We are working on creating this, but for the moment, this forum is a good source of info! This is a good idea. We will work on this. @AnkerOfficial can you please pin this post so it is easier for people to find and look for solution for eufycam issues. Sure, it has already been pinned under eufy product discussion.